It’s time to play ball! Our professionally designed courts are ideal for gathering with family, friends and coworkers for a challenging and invigorating game of basketball, volleyball, badminton, racquetball, wallyball, or handball. We also feature a variety of special court events each month. Join us! We offer many open gym, family gym and pickup games throughout the week. The collegiate-sized gym can be divided into two junior high-sized courts with six height adjustable baskets. Balls are provided. We offer many open gym, family gym and pickup games throughout the week. Call 701-234-2400 to reserve your court up to three days in advance. The collegiate-sized gym can be divided into two junior high-sized courts. Balls are provided for checkout at the front desk. 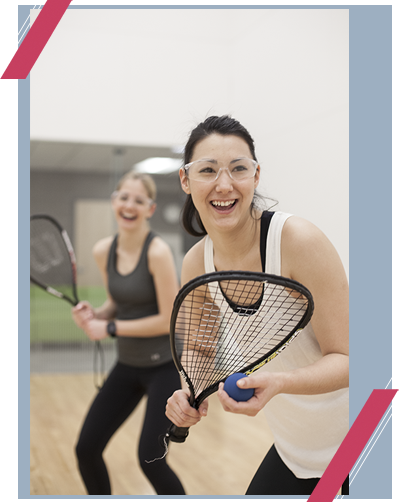 We offer two courts for racquetball reservations. Call 701-234-2400 to reserve your court up to three days in advance. Balls, racquets, goggles and glasses are available for check-out at the Front Desk. We highly recommend that you wear safety eyewear. Click here for tutorials from USRA.Org! We offer two courts for handball reservations. Call 701-234-2400 to reserve your court up to three days in advance. Balls are available for check-out at the Front Desk.